The Jats Sikhs were mainly Hindus who converted to Sikhism in the seventeenth and eighteenth centuries in India. Out of the twelve Sikh misls (clan confederacies), almost seven happened to be from the Jat Sikh community. Their most prominent son was Maharaja Ranjit Singh who established the first Sikh kingdom in Lahore (now in Pakistan). Faridkot was a Jat Sikh princely state that is now part of the modern Indian state of Punjab. It began its life as the state of Kot Kapura, which quickly broke up, the original core of the state later being subsumed within Nabha. A division of Kot Kapura which included Faridkot became the heart of an independent minor kingdom of the same name. Its royal family claims descent from Jaisal, the founder of Jaisalmer and ancestor of the kings of Patiala. Son. Born 1628. First king of Kot Kapura. Chaudhary Kapura Singh had converted to Sikhism and founded the state of Kot Kapura in 1705. However, following his death, disputes arise amongst his grandsons which result in the eventual division of the state. The main state of Kot Kapura remains with Sardar Jodh Singh Brar, while his younger brother, Hamir Singh (son of Sardar Sukha Singh) gains Faridkot. Grandson. King of Kot Kapura. Following the death of Sardar Jodh Singh Brar, the state of Kot Kapura is absorbed by Nabha. It may be possible that for a time he also holds Faridkot itself, until later in his reign or until his death (the date of which is unknown). The first king of Faridkot is Hamir Singh, whose rule does not begin until 1763. Grandson of Chaudhary Kapura Singh. First king of Faridkot. Maharaja Ranjit Singh of Lahore, the first Sikh king, annexes both Kot Kapura and Faridkot to his kingdom (much of which is given as a jagir to Diwan Mokam Chand). With the help of the British in India, Gulab Singh regains Faridkot in 1809. Wazir Singh assists the British in India during the Indian Mutiny (or Great Sepoy Mutiny), following which the British Viceroys are established to replace the Moghuls as the highest power in the land. Brijindar Singh does his part for the British during the First World War. He is rewarded with the title of 'maharaja'. Son. Last king of Faridkot. Died 1989. The dominion of India is formed on 15 August 1947 following the official handover of power by the British. The kingdom is subsumed within the republic and its ruler left with just his title. Son. Killed in motorbike accident in 1989. Harinder Singh spends the first years of his reign being assisted by a regent. He later serves in the British army, and survives his son, Har Mohinder Singh, to become the last titular king of Faridkot. Jind is a district which lies in the modern state of Haryana in India. The royal family of Jind shares its Jat Sikh ancestry with the royals of Patiala and Nabha in the form of Chaudhary Phul Singh Patiala. Gajpat Singh inherits the Badrukhan estates from his father. He defaults in paying his arrears to the Moghul Emperor Shah Alam II. For this he is imprisoned and released only after the arrears have been paid. As a reward he is declared raja (king) by the emperor. He subsequently erects a fort at Jind, which becomes his capital. Son. Suffered a paralytic stroke and wife ruled in his name. Sri Bagh Singh gains control over Basia and Ludhiana and receives Gohana and Kharkhoda as a jagir (estate) from Moghul Emperor Shah Alam II. He also enters into a treaty with the British East India Company and fights against the Marathas. In return he is grated territories in Shahajahanabad. Sri Fateh Singh accepts British help to suppress a rebellion by his younger brother, Partab Singh. Son. Hedonistic and probably died of alcoholism, childless. Mother and regent until Sri Sangat reached maturity. Second cousin. Died of acute dysentery. Sri Swarup Singh assists the British during the Indian Mutiny (or Great Sepoy Mutiny), following which the British Viceroys are established to replace the Moghuls as the highest power in the land. Afterwards, Jind receives several territories from the British. Son. Outlived his son, the father of Sri Ranbir Singh. Grandson. Fought in the British army. Died 1948. Kalsia was a Jat Sikh princely state which is now located in the modern Indian state of Haryana. Gurbaksh Singh was a member of the Karora Singhia misl, and it was he who captured many villages around Chachrauli district, Dera Bassi in Patiala, Chirak in Faridkot, and Bambeli in Hoshiarpur district. He was granted the estate of Chachrauli by the Sikh king, Maharaja Ranjit Singh, which was renamed Kalsia after his native village (the village is now in Pakistan). Jodh Singh captures Dera Bassi from Sardar Khajan Singh and also Lohal and Achrak. Sikh ruler Maharaja Ranjit Singh awards him with Badala, Kameri, and Chhabal. He dies after being fatally wounded during the Battle of Multan in 1818. Lahna Singh assists the British during the Indian Mutiny (or Great Sepoy Mutiny), following which the British Viceroys are established to replace the Moghuls as the highest power in the land. Son. m daughter of Raja Raghubir Singh of Jind. Son. Last monarch of Kalsia. The dominion of India is formed on 15 August 1947 following the official handover of power by the British. The kingdom is subsumed within the republic and its ruler left with just his title. Following the very recent death of his father, Karan Sher Singh has to relinquish control over his state. Kapurthala was a princely state of considerable significance, and can now be found located within the modern Indian state of Punjab. The rulers of this Jat Sikh state belonged to the Ahluwalia dynasty. Leader of Ahluwalia misl, Jassa Singh seizes Kapurthala from Rai Ibrahim, chief of the Bhatti. Then he expands his kingdom as far as the banks of the River Jumna. Cousin. Lost a large amount of territory. Fateh Singh serves as part of Maharaja Ranjit Singh's Sikh army and fights several successful battles. He is bestowed with territories which include Dakah, Kot, Jagraoh, Talwandi, Narayangad, and Raipur (Malva). Nihal Singh fights on the side of the Sikhs against the British in India during the Anglo-Sikh War. He receives Nur Mahal and Kalal Majra for his efforts but is penalised by the British with the confiscation of his territories south of Sutlej. Randhir Singh assists the British during the Indian Mutiny (or Great Sepoy Mutiny), following which the British Viceroys are established to replace the Moghuls as the highest power in the land. Randhir is granted territories in Oudh as a reward. Kharak Singh is declared mentally instable, so he has to accept a regency council and later a British superintendent to oversee the administration of the state. Son. Last king of Kapurthala. Jagatjit Singh joins the British army and gradually rises to the rank of major-general. He is awarded the Grand Cross Legion of Honour (by France), the Grand Cordon of the Order of the Nile, and has major decorations bestowed upon him by Cuba, Peru, Chile and Morocco. He also represents India in the League of Nations in 1926, 1927, and 1929. Son. Served in the British army. Son. Served in the Indian army. Sri Sukhjit Singh wins the Mahavir Chakra, the second highest gallantry award, during the Indo-Pakistan War after Pakistan launches a pre-emptive strike on eleven Indian airbases. The war lasts just thirteen days. Following this, East Pakistan succeeds from West Pakistan to become Bangladesh. Nabha is a city in the Patiala district of Punjab. Like Patiala and Jind, the Nabha royal family also claims descent from Jaisal and Chaudhary Phul Singh of the Jat Sikh kingdom of Patiala. 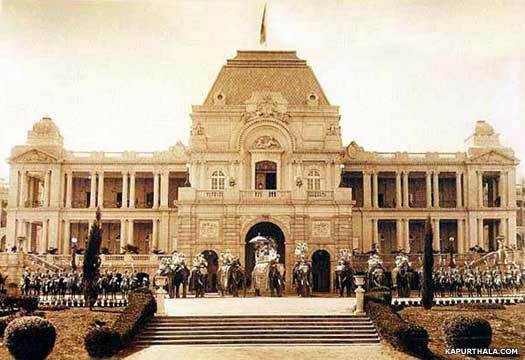 Sardar Hamir Singh, the great grandson of Tiloka, one of the sons of Chaudhary Phul Singh, founded the state of Nabha. It included a sizable portion of the state of Kot Kapur, which had fragmented after 1708. Son. Died 1752 at Fort Dhanaula. Son. Founder of the state of Nabha in 1755. Sardar Hamir Singh fights alongside the Sikhs against the Moghuls. Son. Assumed title of 'raja'. Devendra Singh is charged by the East India Company with siding with the Sikhs during the Anglo-Sikh War. The king is deposed in favour of his eldest son, Bharpur. Nabha's territories are confiscated, many of them being handed to Faridkot. Bharpur Singh assists the British during the Indian Mutiny (or Great Sepoy Mutiny), following which the British Viceroys are established to replace the Moghuls as the highest power in the land. Nabha's territories are restored to the king. Brother. Died without a male heir. Son of Sardar Sukha Singh of Badrukhan (Jind). Ripudaman Singh is deposed due to local Sikh politics. He later intrigues with a religious group against the British and is exiled to Kodaikanal in Madras where he dies. Son. Last king of Nabha. Retained his title only.